Of the nearly 45 million Americans hitting the road for Thanksgiving next week, a large chunk of them will be right here in South Florida. 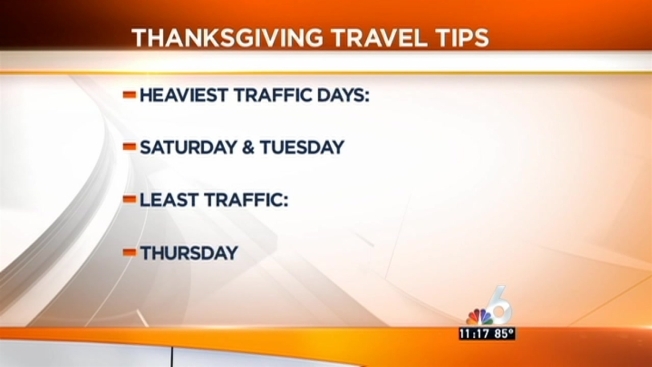 Google Maps just released their annual rankings on Thanksgiving travel, and Miami ranks tenth for the amount of traffic Thanksgiving week. That's slightly better than last year when Miami ranked sixth nationwide. According to Google Travel Trends, the worst time nationwide for Thanksgiving travel is between 3 p.m. and 5 p.m. the Wednesday before Thanksgiving. If you can, Google suggests traveling on Tuesday. While it's the second-worst travel day of the week, Google Maps searches say it's slightly better than Wednesday. The day before Thanksgiving tends to cater to those last minute stops. According to Google Maps data, "ham shop" is the top trending destination search on Wednesday, followed by "pie shop" at number two, and "liquor store" at number three. Travel on Thursday, Thanksgiving Day, tends to be the lightest day for traffic. Headed back home, Google says traffic is significantly worse on Saturday than on Sunday nationwide. For more Thanksgiving travel tips, visit the official blog for Google Maps.